The unemployment rate in Massachusetts is 3.5 percent, but the need for food assistance in Weymouth households is rising as Thanksgiving Day approaches, according to Pamela Denholm, executive director of the Weymouth Food Pantry. Denholm said the pantry will help provide approximately 400 families with turkeys and all the trimmings to enjoy on Thursday. Denholm said the food assistance for the families was made possible with donations from the United Way and local donors. Denholm said requests for assistance from the food pantry by local families has increased by 10 percent since last year. Denholm said the pantry has been able to meet the rising demand for food assistance by providing fresh produce from local farmers through a “Plant Grow Share” program imitative with Interfaith Social Services and Keohane Funeral Home. Denholm said the pantry staff recently planted a community garden at Old South Union Church, which assists the pantry with distributing groceries to families in need weekly on Saturday from 10 to 11 a.m. The pantry recently began serving households in need of food assistance by opening a satellite or “pop-up” pantry at First Church of Weymouth, Nov. 6. The pantry at First Church is open weekly on Tuesday, 10-11 a.m.
Denholm said the pantry plans to relocate its weekly distribution of food in the Monsignor Hackett Center at Immaculate Conception Church to Crossroads Worship Center in January. “We will be finishing up at the Hackett Center this December,” she said. Denholm said the pantry has pleasant memories of its food distribution at the Hackett Center during the past 30 years. “We have a lot of photos,” she said. Denholm said the pantry staff is also gearing up to provide meals for families who celebrate holidays in December, like Christmas, Hanukah, or Kwanza. “We expect to serve the same of families then like we did for Thanksgiving,” she said. Denholm said the pantry is seeking sponsors to provide meals for a local family to enjoy when they celebrate a holiday. Details about the sponsorship of a family will be announced by the pantry on Nov. 27 at the agency’s website. Details for this report provided by the Associated Press. The Weymouth Food Pantry changed to the Pop-Up Pantry model in 2015. The driving force behind this decision was to improve access and create adaptable programming for people who need a little help making ends meet. Three years on, the Weymouth Food Pantry remains a cornerstone for residents in the Town of Weymouth requiring food assistance, and is now set to serve from a new location at The First Church in Weymouth. Denholm met Rev. Tom (T.C.) Coronite in July of this year to first explore the idea. The idea gained momentum with the full support of the church’s trustees, and in a truly congregational spirit, a unanimous vote from the parish. The First Church in Weymouth will open its doors to Weymouth Food Pantry customers for the first time on Tuesday, November 6th at 10:00am, and every Tuesday thereafter. "Our church is so excited to partner with the Weymouth Food Pantry. The history of our church has intertwined with the history of this town for almost 400 years, and we are thrilled to add another layer to our bonds of community, fellowship, and faith," said Rev. T.C. about the partnership. With the holidays closing in, and the winter season not far away, this extension of service is timely. Weymouth Food Pantry is gearing up to serve more families this Thanksgiving and Holiday season than last year, and with higher than average summer numbers they are expecting a busy winter as the cost of heating adds an extra layer of financial pressure to many families struggling to make ends meet. The new location is in addition to the original Pop-Up Pantry at the Hackett Center at Church of Immaculate Conception in East Weymouth, Old South Union Church offered to be a host the pantries on Saturday mornings. This not only helped the pantry reach residents in South Weymouth, but it is also a weekend option for those who work during the week. Weymouth, MA – As the Weymouth Food Pantry ramps up for their summer programs and prepares for the Fresh Bite 5k run at Wompatuck State Park in June, the timing could not be more perfect to welcome newly appointed Executive Director, Pam Denholm. Denholm spent eight years nurturing a community around food and brings previous non-profit and fundraising experience as well. She is the prior owner of South Shore Organics, a farm-to-home fresh produce delivery service bringing locally grown food from Massachusetts farmers to South Shore residents. Improving access to fresh, locally grown nutritious food was one of Denholm’s primary goals at South Shore Organics. When asked about her priorities, Denholm said, “We are focusing on programs to offer more fresh foods and healthy options to families in need in Weymouth. We would also like to reach more children in the Weymouth School system who experience food insecurity.” The Fresh Bite 5k fun run fundraiser is an important vehicle for the pantry to deliver on their mission to offer more fresh food. Other summer projects include a ‘Farm to Family’ initiative in collaboration with the Weymouth Farmers Market, and ‘Plant. Grow. Share.’—a program that mobilizes backyard gardeners to grow more food locally to eat, or share, depending on their needs. “I’ve lived in countries where food insecurity is a reality for a majority of the population, but these communities still thrive. What makes the difference is people, and the concern they show for each other. The Weymouth Food Pantry is innovative and creative in how it engages the community it serves and is well supported by its neighbors. I’m very excited to be joining this team! Our goal is to make Weymouth just such a thriving community,” says Denholm. Check out these tomatoes! It doesn't get more local than from a neighbor's backyard! Year-round we're always working to have fresh fruits and vegetables available, but at this point in the summer, our partnerships with backyard gardeners, the local farmer's market, and local farms and grocery stores are in full effect. Farmer's Market SNAP Program volunteers excited to be launching this new program. For the second year in a row, we're collaborating with Keohane Funeral Home which provided free seedlings to backyard gardeners in June. The results of those gardening efforts are just beginning to appear on the Pantry's shelves: tomatoes, peppers, and zucchini galore. In addition to neighbors who stepped forward to help, the seedlings were also made available to families who use the Food Pantry so they could grow some of their own food if they had gardening space. 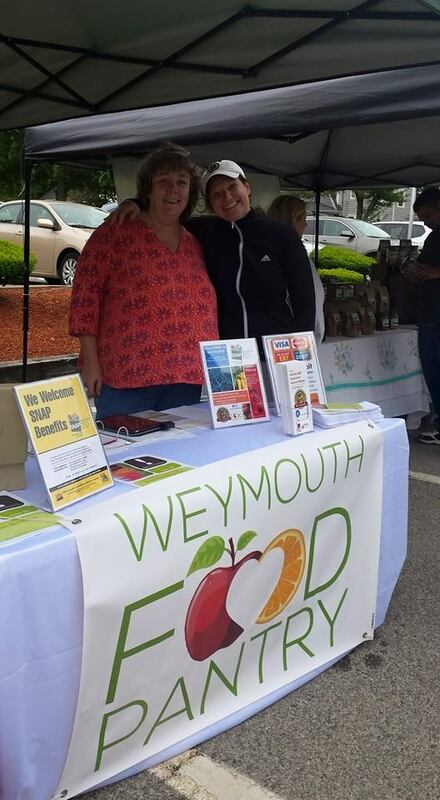 This summer we've also launched a new partnership with the Weymouth Farmer's Market to double people's SNAP (aka food stamp) dollars at the market in order to make fresh, local produce accessible to every family, regardless of income. It works like this: you head to the Market Manager's table when you arrive and we'll run your EBT card for whatever amount you'd like and give you that money in "market bucks" which are small wooden tokens that will never expire. In addition, we'll give you twice the value of the amount you charged to your EBT card (up to $20 per day). So if you were to charge $20 to your EBT card, we'd give you $40 in market bucks to spend at the Farmer's Market. What a deal, right? Also, the system also enables us to charge debit cards at the Market Manager's table, which means it's not only people using EBT cards who are using the system, but anyone who'd like to use a card instead of cash at the market. We hope this will make using the system more comfortable for people. Thank you to our fantastic donors and volunteers who stepped forward from our Facebook page to make this program happen. It's definitely a community effort! Speaking of community efforts, we're grateful to Weir River Farm in Hingham for the gorgeous summertime produce they've been donating. Another favorite has been all the strawberries BJs Weymouth has been donating. When they arrive, the smell permeates the Pantry like nothing else. We love it! Thank you to all our collaborators, partners, volunteers and donors who are making it another bountiful summer of fresh fruits and veggies. Thank you, Weir River Farm! I’m very excited to be writing you with some good news about the Weymouth Food Pantry. As you know, we learned some time ago that the building that we have been housed in for the previous 28 years would be sold. Since then, we’ve spent a great deal time looking for the perfect space-- one with enough square footage to hold the tremendous variety of donated foods from all the caring people and businesses around town; enough parking to hold both our clients and the many dedicated volunteers who show up day in and day out to make sure every family has food on their table; in a central location that is easily accessible for families who need to use the Pantry; and at a price that enables us to keep our priorities where we believe they should stay-- on feeding people instead of paying for overhead. Currently, 1 in 10 people in our town deal with occasional to regular hunger. Thanks to all the wonderful help from all of our volunteers and staff and donors, we’re serving 55% of those individuals (2,826 people) right now. That’s a wonderful accomplishment of which we should be very proud! But it also means that we have yet to reach the other 45% of the people who still need help. After much deliberation, the Food Pantry’s Board of Directors has decided to seize the opportunity provided by our impending move to adopt a new operational design that will enable us to provide food for twice the number of people by distributing food directly within every village in Weymouth. Because this new design will also enable the organization to fit into a smaller building, finding a new home will now be easier and-- most assuredly-- less expensive. We will establish partnerships with churches, housing projects, schools, service organizations, and others willing to host a “pop-up pantry” in their space for 2-3 hours at a time. For each pop-up pantry, staff and volunteers will truck in everything that’s needed to set up a temporary distribution point in the partner’s space and take it down within a couple of hours, taking any remains back to the warehouse. Families from each village in need of emergency food will be able to access a pop-up pantry nearby. After setting up a few pop-up pantries in East Weymouth, we will add more and more throughout town until we reach every village in town. The second major hurdle many families experience in accessing the Food Pantry currently is our (mostly) morning hours. Working families need an array of options for food access, especially in the evenings and on weekends. To attend to this need, not only will the pop-up pantries be in every village, but they will span a range of times: mornings, afternoons, evenings, and weekends. This will increase the likelihood that a working family with limited time and a frequently-shifting schedule will be able to access emergency food at some point in their week. Our volunteers have always been the lifeblood of the Food Pantry and they will continue to be. All current volunteers will be needed in this new style of operating-- some at the warehouse and others at the pop-up pantries. We hope to convert the current Tuesday and Thursday morning distribution times to pop-up pantries at some point this summer and all the volunteers who currently power those distribution times will be needed at the pop-ups. There are many good-hearted folks in town who want to help and as we branch into every village, more volunteer help will be needed. Since some of the pop-up pantries will be held on afternoons, nights, and weekends, volunteering should be easier for students as well as our neighbors who work 9 to 5. Again, I couldn’t be more excited to share this news with you: with your support, we’re bringing our motto of “neighbors helping neighbors” alive in a village-by-village way. Thanks to all our generous donors, community partners, dedicated volunteers, and friends. Ending hunger in Weymouth is within reach. Let’s do it! PS: Seeking a way to help us reach our goal of ending hunger in Weymouth? Join us at the June 20 FRESH BITE 5K or donate today.